First airing on FOX Friday, September 14, 2007, episode 16 of the show, "What's up Duck?" takes viewers to Barefoot Landing for the 3rd annual duck race, benefitting the Humane Society of North Myrtle Beach. Viewers also caught the Sanson Brothers at HB Spokes, and Eason at McLean Park. And we headed to Little River for the 9/11 Memorial and fallen Charleston firefighters tribute. 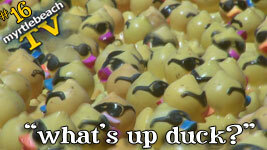 Watch episode 16, "what's up duck? ", in its original HD format, by clicking here, or by clicking on the episode 16 screenshot above.